Wow. It seems like I haven't written in ages and in fact, it's been 5 days. 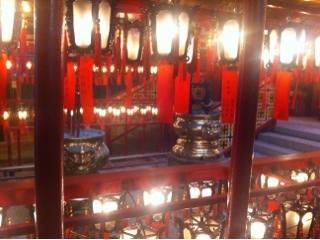 I left Hong Kong yesterday after 4 nights. I stayed with one of my Memphis neighbors who recently relocated, Shea. It's amazing just how much I've seen Memphis friends on my trip so far. The first full day I spent relaxing. I took my laundry to be washed and had lunch at a local English pub. That evening, we went out with a relatively large group to a local club / bar (after first stopping at a local pub and a pizza place). Many of the people in the group were also either from Memphis or had lived in Memphis-- and a few still had condos downtown. 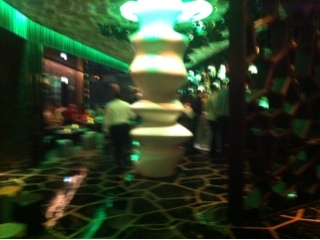 We had drinks and enjoyed dance music and bright lights. It's interesting how much popular music is the same everywhere. I've heard the same songs in bars and clubs in every country I've visited. 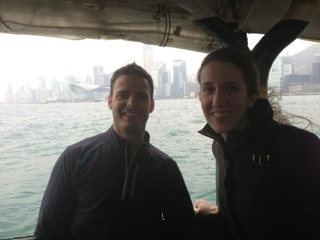 The next day, we visited another part of Hong Kong for lunch with part of the group from the night before. The location was beautiful and we got a chance to check out the markets, but unfortunately it took a curvy taxi ride to get us there. I felt sick all day. The following day (which was the last full day) was by far the most exciting. We walked all over Hong Kong. We saw parks and a zoo. We took a tram up to see Hong Kong from one of its highest points. While waiting in line, we made a new friend from the US, Kathryn. She lives in Denver, but used to live in Memphis and knows a few of the same people I do! 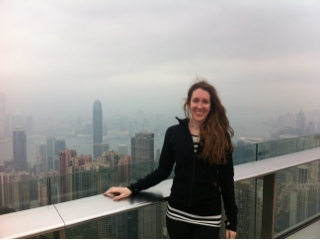 Kathryn joined us on the walk down the hill and together we all went to the Hong Kong Art Museum. Afterward, we checked out the worlds highest bar. I think it was called O Zone. It was very stylish, but they seemed to struggle with processing payment transactions. I won't get into it here, but lets just say it was a little shocking how hard it was for us to pay our bill. 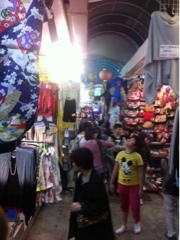 After dinner, we went to the night market, the "wet" (food) market, and the ladies market. 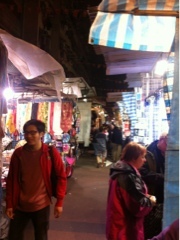 We also had dinner at a street vendor at the night market. Everything was very different and interesting. Overall, Hong Kong was much more organized and less fast paced than I had imagined. There were surprisingly high numbers of foreigners living there... All with very interesting jobs. The weather was great, the people were great. Overall, it the city gets an A from me. :-) Shea also deserves a huge thank you for being such a great tour guide! 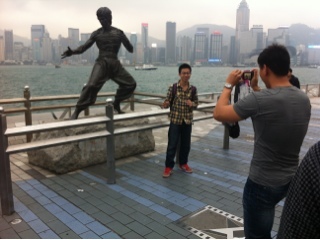 Below are a few photos from my time in Hong Kong.